Many years ago, when I was a child, my mother pointed out (repeatedly!) that the first thing to do after making a mistake was admit it. Because if you didn't admit your mistake, you'd just keep on making the same one, and whatever you'd been doing would be ruined. "Admit it, then learn to fix it, then learn how not to make it again, and you won't have to be afraid of trying new things because you 'might make a mistake.'" Don't you kind of cringe when your mother is STILL right, even after she's been dead for 25 years? But she is, and admitting it is the first step to getting it. I don't know why the laddering started...it almost looks like a dropped stitch even, but the stitch count on the needles is correct--so no droppage. But my mistake was thinking (twice) that I'd fixed the earliest laddering and going ahead without looking on the inside of the sock, where clearly no fix had happened. Until the moment the widening rungs of the ladder made it painfully clear. For non-knitters, look at all those little bumps...the "purl bumps" running along side by side and evenlytoward the bottom of this image. That's how it's supposed to look. 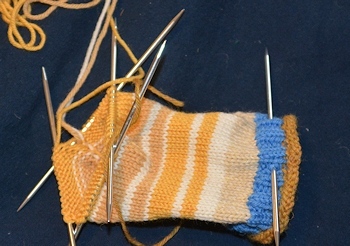 A little roughness (where stitches were taken with two yarns while changing color) is normal--large bicolored bumps, for instance--and short "stitches" running vertically across a stripe in another color are intentional. But there shouldn't be straight strands running horizontally or diagonally between the regular bumps to the bottom and the regular bumps to the top of this image. And there are. The only way to fix it at this point is to rip it back to before the first ladder and try again. Oh, sure, I could take a strand of yarn, run it from side to side with a yarn needle, yanking the two sides together and stitch them down--making a really bulky line under my foot and destroying the flexibility of a knitted fabric in the process. But that's not the real fix. 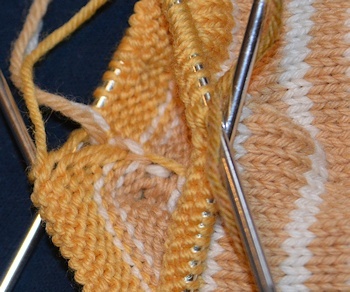 The real fix is to rip back past the laddering, get the good stitches onto needles, and this time knit it correctly. It would help if I understood what I'd done wrong. But I don't. I'll just have to be very, very careful. And it won't be a quick fix, since I'm not at all sure I can get those stitches back once I've ripped back that far...and I don't know how that yellow yarn will behave when it's been ripped back. Some yarns hate it and go all fuzzy and try to unwind their plies. If I had ripped back the first row that laddered...admitting the mistake right off the bat...I wouldn't be faced with a harder job now. So Mother was right. Again. Her voice in my head is giving that mother-sigh and wondering if I will ever learn and suspecting that if I haven't learned by now (age 70) it's probably useless to keep telling me. But still. Haste makes waste. Hurry makes worry. Do it right the first time. If you don't do it right, you'll have to do it over. Etc. Sympathies, I had a mother like that. Give your self credit, you learned, you just didn't notice (that is a different error). My mother drove me crazy with the being right thing. To be honest it is still driving me crazy. I was knitting while watching TV. That's probably why I didn't catch it right away, but I noticed it a couple of rows later and decided not to rip back but go on and "tighten" by knitting what I thought were the problem stitches through the back loop. Doesn't always work. My gran always told me, "to be a good knitter, you have to be a good ripper." I often hear her voice in my head when I notice a similar mistake in my knitting. Funny that. My mother said that about sewing, but not about knitting (hmmm, maybe she generalized easily?) "If you want to sew, you have to accept you'll be ripping out a lot." I do not sew except in emergencies. Oddly, I don't mind revision in writing--it doesn't make me tense and sweaty, the way ripping out a seam does. I see that I didn't say something the best way, and change it, and it's painless. I said something today at my daughter's house, forget what now, and said, "Oh dear, I sound exactly like my mother! Do you catch yourself saying things that sound exactly like me sometimes?" "Yes, all the time," she said. "So I suppose that sometimes I must sound exactly like Gran!"